Does the National Football League bore you like it does me? I used to love the games. Thanksgiving was the day I would gorge myself on football and turkey. But last Thursday I watched a little of the Lions (who did they play?) and ignored the games that followed. The NFL has a lot of problems. The players die young or damage their brains. It still attracts the gladiators, but a lot of parents are pushing their boys toward other sports because of the apparent dangers. There are few good teams in the NFL these days. It’s the Patriots, the Eagles, maybe Minnesota and New Orleans. And who cares? Green Bay used to be fun to watch because of Aaron Rogers, but then he busted his clavicle and they are now just another awful team to watch with a pathetic quarterback who is afraid to throw the ball more than 10 yards. The coaches of most teams play a boring, risk averse, strategic game of field goals, with most games decided by turnovers rather than brilliant offense. There are virtually no great running backs in the game. Name one after Ezekiel Elliot of Dallas, who is suspended for six games now. Teams do not even draft running backs much because they are rarely good for more than two years after being chewed up by injury. I watch football mainly to see the quarterbacks do their magic. Without Aaron Rogers playing, you have the great Tom Brady at 40, the magician, Russell Wilson, in Seattle, and a few interesting young guys like Carson Wentz and Jared Goff. Andrew Luck used to be the equal of Brady and Rogers, but injuries have really diminished him. He hasn’t played a down this season and is consulting everybody west of Tibet for a hopeful answer on his damaged throwing shoulder. It is a crazy sport that devours its stars like they were s’mores. TV ratings are down for the NFL, and the League cannot fill the stadiums. Even teams like Pittsburgh are having trouble because they are so predictable and cannot seem to find a successor for Ben Roethlisberger who is looking more like a statue each year. The Colin Kaepernick kneeling act is not really the League’s big problem. It was a diversion from the boredom of the game as the season began, yet it did reflect the alienation of many African American players who see themselves as powerless pawns of the owners. One of the advantages of Major League Baseball and the NBA over the NFL is that the players see themselves as partners of the owners to some degree, while the players have virtually no power in the NFL under Roger Goodell, who is paid a $50 million salary with use of a private jet for life. Also, baseball and basketball are developing an international following with international players on every team. Football is strictly a U.S. game, and the experiment of playing one game a week in London has been a failure. Players hate it. Fans don’t show. A good Super Bowl can still be a fun occasion, but week-to-week pro football has lost its pizzazz and lost me as a regular viewer. Question 1: Have you lost interest in the NFL? Question 2: Who is your favorite running back ever? I care not for sports of any type that is “professional”. Even the collegiate doesn’t interest me because they tend to “hire” in people who run off to China and steal. We see this a great deal here on the U of I campus. What I support and encourage is the sports that are personal bests and not so much team sports. Track and Field and running events and the Olympics is fine but I’m less and less interested. As for the NFL it’s a sport filled with big baby men who care not for their players and only want to mash heads in and make lots of money. I hope it falls from grace and is such a financial loss because of the events of these protests that it never recovers. But that’s just me. From what I have read the players have signed an agreement and they are not keeping it when the protest. It’s all a bunch of nonsense. I will not give money nor my time to this corporation and will not support the Super Bowl nor the musicians that perform at it. It’s one huge Hedonistic pornographic mess in my opinion. NFL is a terrible bore – players don’t show up to play every play. If they didn’t have fantasy football the ratings would be horrific. College ball is twenty times better. Goodell is just an example for the players – over paid to under perform. He is gutless to do anything of importance. Favorite running back – Franco Harris – Immaculate reception! Back when the NFL was interesting and players showed up to perform not to protest. Since the teams and players have not shown respect for our flag I have lost respect for the NFL. I think that the armed forces should not be a part of fly overs or any other parts of the pregame or half time as long as our flag is not being respected. I have completely turned of the NFL on TV and make sure that I don’t buy any thing that supports these over paid pre-madonas. 1. Most definitely. Too much arrogance, not enough talent. There has been some fall off, but as long as Jeff said above, you have Fantasy FF and gambling—- NFL is not going anywhere. Just lose casual peeps. Main guys now are only care about FF and money. Some interest in home team, but not much. 1: Still Love the NFL. Of course that’s probably because I’m a Patriots Fan! (That ought to get some nasty responses!) And yes I do live in NE and yes I do think Tom Brady got railroaded. 2: Favorite all time, Barry Sanders. Nobody else ever cut like he did. Favorite Now, Le’Veon Bell of the Steelers. I love the way he hesitates then explodes. $50 mill, and a jet for life? Didn’t know that! If that’s the case, the NFL “fell” a long time ago. But they’ve cetainly “fallen” since K’nick took his kneel. I have had Season tickets to the Browns for 47 years (except the years when they went to Baltimore) I have enjoyed the time with my children, and grandchildren at the games (win or loose, mostly loose) this year we attended first three games and have given away tickets for the balance of the season. We have notified the Browns we will not renew our tickets for next year. The team and owner don’t understand that this is a job, the fans write checks for tickets, parking, concessions, pre or after game celebration, and also provided tax relief, and revenue to support the facility, and insure their financial success. The time has come for this to end, these big babies who disrespect this country are disgusting. It is a combination of many things, prima donnas not respecting the flag, oversaturation of games, mediocre games after the first half of the season, the emergency of college ball, but even there is a major falling out of grace brewing, stupid targeting rules, etc. But in reality what it boils down to it is that there is no identity anymore. Where is the Iron curtain anymore? Not in Pittsburgh; what happened to Air Corriel? Heck, not even in San Diego, Carson? they don’t even fill a 25K stadium. The fearsome Foursome? no where to be found. Montana and Young to Rice? What is that? Marcus Allen and Eric Dickerson going for 2000 yards? are you insane, no way! 1. I never watched or cared about football until Charlotte got a team. I love my Carolina Panthers and have been a season ticket holder since the beginning. They are definitely the Cardiac Cats and more often than not keep me biting my nails until the last second, but they are MY team. I love watching them play away games where you can still hear the Panthers fans yelling “LUUUUUUUUUKE” each time Kuechly makes a tackle… nice to know there are fans outside the Carolinas now (transplants for sure, but still…). 2. Christian McCaffrey right now. He’s not big, but he’s strong. Jonathan Stewart has lost some of his shine. Hard to think that in this profession, 30 is old! Glad I’m in marketing! 1. I don’t watch the NFL as much as I did because so many of the games are just boring. There are so few competitive games. I don’t find the protests disrespectful of the flag but more of a free speech issue. The players are using the platform they are given and their actions speak louder than any statement they can make in interviews. I equate their protests with Rosa Parks not moving to the back of the bus. 2. It is hard to pick a favorite running back. You have Sweetness and Sanders for their fluid running style and Earl Campbell and The Bus for their power running style. Used to enjoy watching, not anymore. The league has a handfull of good players surrounded by a bunch of over paid cry babies. I have not watched a full game now for 5 or six years and with the current “take a knee” crowd I don’t see watching one again for the near future. Present – “Running back” to the kitchen for a snack. – Was a big Fan. No More. – Goodell is leading by example…overpaid and underperforming. – Players are divas…feeling abused by owners despite making more money in one season than 95% of their fans make in their life; enjoying better benefits and guarantees too. – Kap is an underachiever who took to demonstrating when his actions and level of play weren’t good enough. Sounds a lot like our political picture today. And the media was ready to gobble it up to make up for low NFL ratings. Disgusting. – The media was made a mockery when Political Correctness took over common sense. You should be able to express what you see without fear of retaliation, being fired, or worse. Now commentaries are boring and spineless. – Overall it became a money game, where an owner with identical initials could care less that his team has been losing for decades since the money from sales, tickets, ads, and contracts keeps rolling in; so he decides to make of the team his posse regardless of performance at the expense of the fan. – I was happy to sell my season tix at a loss just to get out from underneath the abusive psl format. – A friendly FFL with some close friends is the only thing keeping me from total divorce from the league. I used to be a Bengals fan. I started watching them back in the late 70’s. The rest of my family are pretty much Brown’s fans. Now a days I don’t really care. The way the Bengals behaved during the game with Pittsburgh …AND THEN DEFENDED Burfect and Jones made me sick to my stomach as well as ashamed. As time went by I ended up just not caring because it appears the Bengals behavior is the rule rather than the exception in the NFL. It’s no longer focused on a game, the game is incidental to the business. It used to be the NFL was a football league that made money, now it’s a financial institution that sponsors some “football game like events”. The current state of overpaid, self-important prima-donnas doesn’t help anything either. I have a hard time comparing this bunch to real civil rights hero’s like Rosa Parks (not a slam on an earlier statement, just saying it doesn’t compare in my mind). Many friends have switch to college football. When I read about the amount of revenue the university football programs generate I’m not really sure how much of a difference there is. #2 – Since I live in Ohio I should pick Zeke, but let’s face it, he didn’t get suspended because he’s squeaky clean. If you would like a good read, look up Mike Rowe’s response to this years NFL , and Politics. It is worth the read. Until we the paying public shut off the TV, Game day tickets , and merchandice, the NFL and politicians will continue to accept our donations to THEIR cause. By the way tell all the people that have lost their jobs because of the posts that they made on social media about freedom of speech. Jim Brown is still the best ever. You are just falling into the trap of FACIST propaganda. Ignore the IDIOT in the white house and watch your football game! LOL! spoken like a real actual fascist! In case you missed it, There are a lot of reasons listed as to why people are done watching the NFL and not one of those was “because the President said so.” Cast off your hatred, you’ll live a much happier life. The players are not preparing for the game in the same way old. Too much money and too many criminals. Sweetness! Look at his approach to the game and life, Sweetness! I stopped watching professional football 20 years ago because of the arrogance and attitudes of so many of the players. I switched to hockey and enjoy the game for the speed, skill and because most of the players seem like genuinely nice guys. 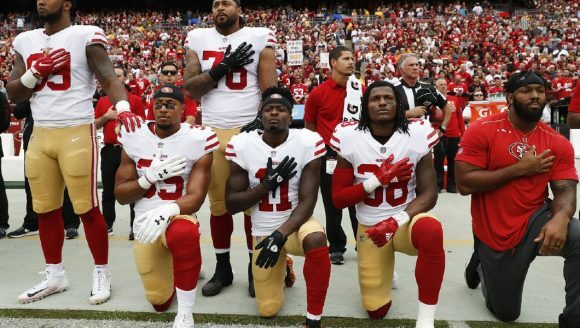 At first I was angry when the players took a knee and disrespected the national anthem. As previously stated, a bunch of overpaid crybabies that didn’t appreciate what they had. But, after that, I guess it is just a transition in our society. Why do we expect our professional athletes to be role models? Most are not very good role models, so we should not be disappointed when they are arrested, kneel, etc. Many grew up in the inner city with single parent homes and didn’t have any good role models themselves growing up. Not making excuses, just reality. I now try to just look at them as employees. They are paid to perform on the field and play. Period. I really don’t care what their political views are. Just catch the ball or run for a touchdown. If you don’t perform, you get replaced by someone better. What would happen if I decided to have all of my employees say the pledge of allegiance or sing the national anthem every morning in the office? Do I have the right, as their employer, to demand that they say the pledge? I do not think that would fly. Why is the NFL any different? Hopefully, MLB will avoid this mess because most players have to earn their way in the minor leagues first, and make very little money, before they can move up to the big leagues. That time in the minors should make them appreciate the opportunity to play in the majors, and their attitude is much more positive. But, who knows! Favorite running backs – OJ (back in the day he was impressive), Walter Payton, Barry Sanders, Larry Csonka. Down here in St. Louis I have watch two football teams leave be3cause of greed. The year the Rams left, my son left for school – to Alabama.